On September 29, 1938, Adolf Hitler and the leaders of three other European nations signed the Munich Agreement, formerly giving Germany control of Czechoslovakia's Sudetenland. Convinced that the agreement had prevented the outbreak of war, British Prime Minister Neville Chamberlain proclaimed that the agreement would guarantee "peace in our time." 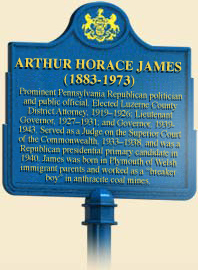 That November, Pennsylvanians elected Judge Arthur James (1883-1973) as the Commonwealth's new governor. A rock-ribbed Pennsylvania Republican, James was the epitome of the American self-made man. As a child, James had been a breaker boy and mule driver in the coal mines of northeastern Pennsylvania. A determined youth, he went to school, earned a law degree, then became active in state politics, winning election as the Commonwealth's lieutenant governor in 1928. 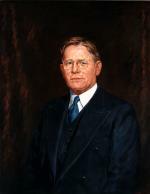 After his term, James had served on the State Superior Court until the Republicans picked him to run against Democrat Alvin Jones in 1938. James promised to reduce taxes, balance the budget, make Pennsylvania more attractive to businesses, and end widespread political corruption. That November, the judge tallied the largest vote ever given to a gubernatorial candidate in Pennsylvania. Inductee's physical, Pittsburgh, PA, circa 1943. James was in office less than a year when war broke out in Europe. Conflict in Europe and Franklin D. Roosevelt's strong desire to strengthen the United States soon led James to shift his focus from dismantling Pennsylvania's "Little New Deal" to military preparedness. As the nation began to build its defense industries, Pennsylvania became the first state to undertake a statewide inventory of existing plants and of how each might contribute to national defense. In 1940 and 1941, James prepared the state for war. By the time Congress passed the National Selective Service Act on September 16, 1940, James and his staff had already created the Pennsylvania Selective Service System to prepare the Commonwealth for this massive interruption of private lives. The System divided the state into 422 local draft board areas, each with about the same population. Governor James named Lafayette College president William M. Lewis, state director of the System, then appointed advisory committees in each county to recommend members for the local boards. Using local teachers and other volunteers, the state system registered well over 1.5 million men in just one month. James supported the "Pennsylvania Plan," under which a draftee, once he had reported for service and passed his physical, could return home and see to his civilian affairs before reporting for assignment. Other states followed Pennsylvania's lead. In April 1941, James appointed Dr. A. C. Marts of Bucknell University as first executive director of the State Council of Defense. The State Council then created more than 1,100 local councils to organize protection against enemy air raids. Pennsylvania's Citizens" Defense Corps (SCD), as it became known, enrolled more than 600,000 civilians to act as air raid wardens and associated personnel. "You just don't know what to expect," remembered Mrs. Anne Strode, who worked as a civil-defense telephone operator in the basement of the Chester County Courthouse. Another division of the SCD was the Aircraft Warning Service (AWS), run by the U.S. Army. Another branch supervised the organization of child-care centers to help working mothers, while the Victory Garden section helped citizens plant their own functional vegetable gardens. The American Legion gathered volunteers for the AWS, whose primary mission was staffing around the clock about 1,200 outdoor observation posts in a region that stretched from New Jersey to northern Virginia. These men peered through binoculars and watched every aircraft and reported their flight patterns to ensure that no enemy aircraft sneaked into Pennsylvania skies. Once the state National Guard was federalized in 1940, the Commonwealth created the Pennsylvania Reserve Defense Corps; 5,000 men in surplus army uniforms and equipment who guarded strategic points around the state after the nation went to war. Small-boat owners created the Temporary Reserve of the Coast Guard, and used their own small craft to help patrol the shores, watching for enemy submarines and saboteurs while also acting as river police. To ensure that Pennsylvania's 200,000 farms could produce the food needed during a war, James also created an Agricultural Defense Committee to secure draft deferments for essential farm personnel. When the Japanese attacked Pearl Harbor on December 7, 1941, Pennsylvania, through the efforts of the James administration, was already on a war-time footing. In the years that followed, James led the state's mobilization for the war effort. After President Roosevelt federalized the Pennsylvania National Guard, James established the Pennsylvania Reserve Defense Corps to protect the state from any possible attacks, and the Citizen's Defense Corps to watch against air raids. He also helped organize the war efforts of the state's civilian population. Pennsylvanians helped collect more than 2.5 million tons of scrap paper, tin, aluminum, rags, and fat, for processing into useful materials to aid the war effort. In 1944, James was succeeded as governor by General Edward G. Martin, a veteran of four wars, who would lead the state through the final years of the war. After leaving office, James served briefly as a state Superior Court judge before returning to Plymouth, Pennsylvania, where he practiced law and remained professionally active. Governor James died on April 27, 1973. To learn more about Governor James rise to prominence and his election as governor in 1938, click here. , Pennsylvania's First Year at War, December 7, 1941-December 7, 1942 (Harrisburg: Pennsylvania Historical Commission), 1943. Sylvester K. Stevens, Pennsylvania: The Heritage of a Commonwealth (West Palm Beach, FL: The American Historical Company), 1968.